Note: Please do NOT use the "Clear Attempt" button. The "Clear Attempt" button will delete all of the all information and data associated with the student's attempt; and thus all the data we need to investigate the issue. 1. In the Grade Center, locate the cell for the student and the test. 2. Click the downwards-facing chevron to open the menu for that cell Then, select "View Grade Details". 3. On the Grade Details screen, you should see the student's attempt(s). 4. To the right of each attempt, you should see 3 or 4 buttons. Please click the "Ignore Attempt" button. This will require the student to start the test from the beginning with full time within the current availability settings. Note: Clearing an attempt is permanent and all data associated with that attempt will be deleted. If the Test Availability period has ended, you will need to specify that student has an exception to have another attempt in the Test Options. 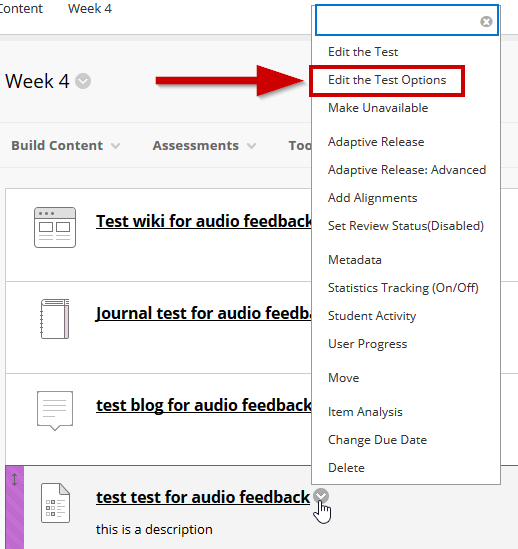 To view the Test Options, go to where the test is located in your course and click the downward-facing chevron to open the menu. Select "Edit the Test Options". 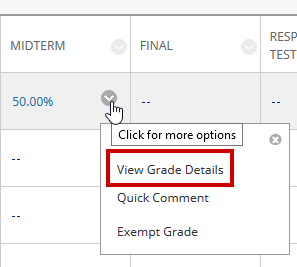 Scroll until you see a box labeled "Test Availability Exceptions" and add the student that needs an additional attempt. Click "Submit" when finished. For one-on-one assistance with test exceptions, please contact the Instructional Technologies team via Contact eLearning Support.